we use whole wheat pitas as the layer base for this dish instead of traditional corn tortillas. What is a chilaquiles casserole you ask? Chilaquiles is a traditional Mexican dish. Typically, corn tortillas cut in quarters and lightly fried are the basis of the dish. Green or red salsa or mole is poured over the crisp tortilla triangles, called totopos. The mixture is simmered until the tortilla starts softening. Eggs (scrambled or fried) and meat (usually chicken - but not here!) are sometimes added to the mix. 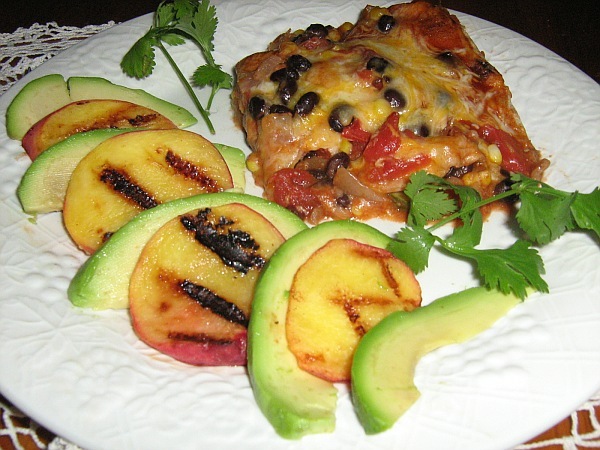 The dish is topped with cheese and/or sweet Mexican cream and it is often served with refried beans. It is usually a breakfast or brunch dish but we like it anytime - especially this vegetarian version. In fact - as mentioned earlier, we mixed it up a bit by using whole wheat pitas instead of the tortillas. We think you're gonna like it! Coat a 9 x 13 inch baking pan with cooking spray. browned - about 5 to 7 minutes. Stir in the cumin, zucchini, beans and corn and mix well. the vegetables are heated through - about 3 minutes. the pitas. Spread one can of enchilada sauce over the veggies. repeat the process, finishing off with the second cup of cheddar. bubbles around the edges - about 10 to 12 more minutes. Serve with avocado slices, fresh fruit and your favorite beverage. the "temperature" with hotter enchilada sauce - whatever you like!